Get off at Asok Station (E4) and exit through Exit 6. Take a motorcycle taxi or walk 300 meters towards The Emporium along Sukhumvit Road to Sukhumvit Soi 20, turn right into Sukhumvit Soi 20 and walk 400 meters down the Soi until you see Mille Malle Community Mall on your right. Alternatively, you can get off at Phrom Phong Station (E5) and take a motorcycle taxi or walk 600 meters towards Asok Intersection along Sukhumvit Road to Sukhumvit Soi 20, turn left into Sukhumvit Soi 20 and walk 400 meters down the Soi until you see Mille Malle Community Mall on your right. We are on the 2nd floor. Get off at Sukhumvit Station and exit through Exit 3. Take a motorcycle taxi or walk 300 meters towards The Emporium along Sukhumvit Road to Sukhumvit Soi 20, turn right into Sukhumvit Soi 20 and walk 400 meters down the Soi until you see Mille Malle Community Mall on your right. We are on the 2nd floor. From Sukhumvit Road turn into Sukhumvit Soi 20 and drive 400 meters down the Soi until you see Mille Malle Community Mall on your right. We are on the 2nd floor. Alternatively you can reach us from Rama IV Road; turn into Sukhumvit Soi 24 next to the Esso gas station, turn left after 100 meters into Sukhumvit Soi 22, then turn left at Sai Nam Thip 1 into Sukhumvit Soi 20, then turn right and drive another 100 meters until you see Mille Malle Community Mall on your left. We are on the 2nd floor. Plenty of parking space available. 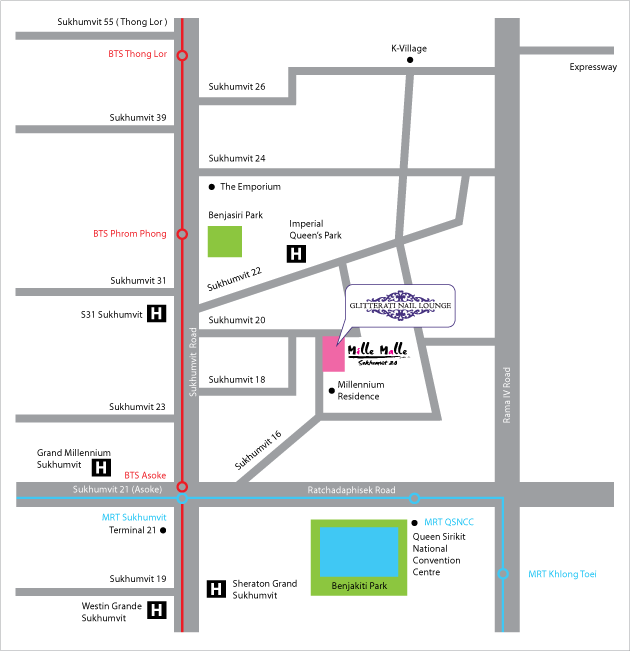 See a Location Map of Sukhumvit Soi 20 and the surrounding area. When asking for directions or telling the taxi driver your destination, say “Sukhumvit Soi 20.” It is very close to Asok Junction (Sometimes spelled Asoke) and every person in Bangkok knows Asok. Once you turn into Soi 20, you can not go wrong as Soi 20 is only 500 meters in length and goes straight all the way. Keep going straight past the Rembrandt Hotel (on your right), after you pass the Family Mart (on your right) and the 7 Eleven (on your left) you will see Mille Malle Community Mall and Wine Connection on your right. Mille Malle Community Mall is situated at the entrance to Millennium Residence condominium; those 4 tall towers visible from most of central Bangkok. Now that you have arrived at Mille Malle, go up to the 2nd floor, our nail salon is in unit #207. Easily accessible by MRT, BTS or private car, Glitterati Nail Lounge is located in a bustling area of Sukhumvit, surrounded by a fabulous blend of local and cosmopolitan culture with a wide variety of shopping, dining and entertainment establishments. Situated within walking distance from popular shopping destinations such as the Emporium (Sukhumvit Soi 24,) EmQuartier (Sukhumvit Soi 24) and Terminal 21 (Asok), and many central Bangkok hotels such as Sheraton Grande Sukhumvit, Grande Centre Point Hotel & Residence Sukhumvit Terminal 21, Grand Millennium Sukhumvit Bangkok, The Continent Bangkok, The Westin Grande Sukhumvit Hotel, Tune Hotel, Radisson Blu Plaza Bangkok, Rembrandt Hotel Bangkok, Park Plaza Bangkok Soi 18, Maitria Hotel Sukhumvit 18 (Formerly Oakwood Trilliant Sukhumvit 18), Thee Bangkok Hotel, Windsor Suites Convention Hotel, Golden Tulip Mandison Suites, Best Western Plus At 20 Sukhumvit, Holiday Inn Bangkok Sukhumvit 22, Marvel Hotel, Citrus Sukhumvit 22, Emporium Suites and more.